Kassia on the go. Photo by Todd Glaser/courtesy of Roxy. Oui, si, or bai, no matter which langauge you speak, you'll want to say yes to a spell at the bohemian playground on the southwestern coast of France. To get the inside scoop, our friends at Roxy hooked us up with pro surfer and photographer , who hosts the longboard invitational during the Roxy Biarritz competition each year. 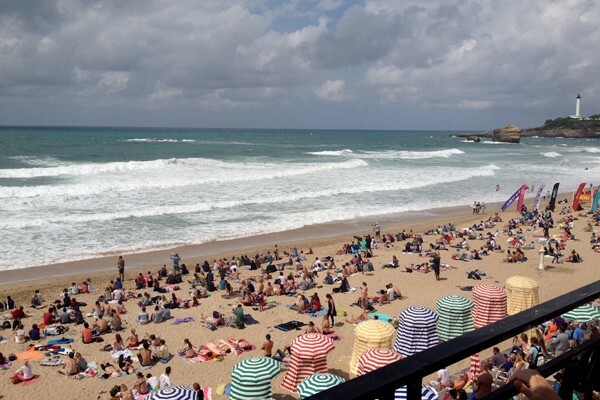 Best place to stay: on Côte des Basques beach. 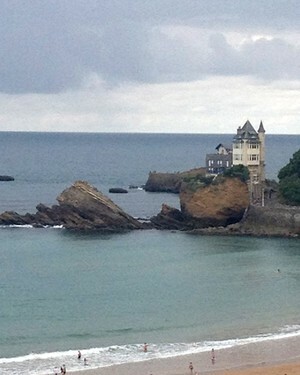 Best surf break: Côte des Basque Castle Peak when it's good. Best breakfast: I like to go to the local market in the morning for fresh fruit and chocolate croissants. Best juice: Pandora's for fresh juice from the market produce we buy in the morning. Best dinner: Chez Pilou (3 Rue Larralde; +33-5-59-24-11-73). Scenes from the beach in Biarritz. Photos: Courtesy of Roxy. Best escape: Walking around the coves. Best shop for gear: in Saint-Jean-de-Luz. Best shop for gifts: There are so many in town. It's fun to just walk around. I bring all my friends who are here for the first time to: Les 100 Marches for tapas, music, and the locals (square Jean Baptiste Lassalle; +1-33-05-5924-7561). Best surprise: The night markets, marchés nocturne, in the main square where the morning markets are held. I always bring back: I love to bring back sand from different beaches. When I'm away, I miss: The French lifestyle. The long summer days and the late evening surfs. I always go back for: My friends Margaux, Pandora, and Farielle. The dance parties. Tea in Margaux's garden. Juice parties at Pandora's and surfing out front on logs. Bottom photo by Todd Glaser/courtesy of Roxy. Kassia is a professional surfer and wetsuit designer who loves documenting her travels with photography. She travels to learn more about the world and to experience as much variety in life as possible.